Although Gauteng is the country's smallest province, it is certainly the most significant in terms of commercial and entertainment viability. It is a hub of activity in which visitors are promised a range of exciting, fun and informative things to do. This destination is characterised by the unique mix of cultures, languages, colours and religions, as well as for its wealth. It is unique in its weather pattern too. Electric storms cool hot summer afternoons and leave one in awe of the power of nature. This province is known for its abundance of gold. In fact, its name originates from the Sesotho word for “Place of Gold”. Although gold was responsible for the initial development of this area, Gauteng is now so much more. Surrounded by the magnificent Magaliesberg Mountains, and within a few hours' drive from world-acclaimed Kruger National Park, this area is valuable for its natural resources on many levels. Gauteng is also the access point for international travellers into and out of South Africa and many of the countries around it. As a base for the exploration of much of southern Africa, it is a thriving, pulsating destination. European prospectors had long known that gold could be found in the ‘dark' continent of Africa. It was in 1886 that the area now known as Gauteng yielded its first impressive rocks, which soon lead to a major gold rush. Mining for gold and diamonds continues to this day. Gauteng has long been the tourism Mecca for those visiting South Africa. Its many shops, designer stores and boutiques have delighted avid shoppers and continue to impress visitors from all over the world. The Moyo Market Theatre is situated in Newtown, Johannesburg, and is a theatre that boasts 250 seats and exquisite décor and artwork. African and Asian cuisine are served in ethnic style and complemented by excellent wines and cigars. Another fantastic cultural experience may be enjoyed at the Theatre on the Square in Sandton City. Musicals, children's theatre, formal shows etc... have successfully been hosted at this exciting venue for approximately a decade. Visitors to Gauteng that value opulent surrounds will do well to experience the luxurious Blue Train, as they embark on a trip from Pretoria to Cape Town. The old-world, colonial charm is set in pure elegance. Butlers, lounges, private bathrooms with gold fittings and marble tiles, under-floor heating and air-conditioning are just some of the features that make this journey from Pretoria such a special one. Gauteng is landlocked and situated mostly on the Highveld. Those areas with a lower altitude experience slightly more subtropical climates. Afternoon thundershowers characterise the summer time, which extends from December to February. This helps to cool the sweltering summer days. Winters, between June and August, are cold and dry, with noonday highs of about 16 degrees Celsius. Gauteng is not known for malaria infections. However, the rural areas and the many game parks surrounding Gauteng have reported rare malaria infections over the years. Visitors that are planning to visit the northern provinces of South Africa and / or surrounding countries are advised to take precautions against contracting the illness. This is achieved by taking a course of prophylactic drugs, as well as treating your clothing and bedding and spraying citronella-based products onto your skin. In fact, precautions against any type of insect bite is advisable when visiting Africa. Sunscreen is essential in South Africa, regardless of the time of year that you visit. In addition, wear protection clothing and a sunhat to ensure that your face, neck and any other exposed area is protected. It is advised that you bring your prescriptions for spectacles and medication so that you can restock at a local pharmacy without having to consult with a doctor. Ensure that your tetanus shots are up-to-date as some areas are fraught with litter, including broken glass, cans and metal. 10 2nd Avenue Houghton Estate, a luxury guesthouse, is situated in the prominent Johannesburg suburb of Houghton Estate and combines opulent surrounds with convenient locale. The African Rock Hotel is an exclusive, luxurious retreat, just a little over 10km from Johannesburg's OR Tambo International Airport. A Johannesburg boutique hotel with so much to offer their guests including 5-star accommodation, outstanding meals, central location and so much more. The Birchwood Hotel is reasonably priced and places top priority on ensuring that guests are comfortable and catered for at all times during their stay. The City Lodge Bryanston Hotel is a suitable accommodation choice for various holiday makers as well as the business traveler looking wanting to be in close proximity to Johannesburg's CBD. Situated in the heart of Johannesburg's Northern Suburbs in the suburb of Fourways, the City Lodge Fourways provides ideal accommodation for travellers. City Lodge Airpot Johannesburg is situated close to the Johannesburg International Airport making it an ideal accommodation of choice for business travellers. The City Lodge Sandton offers guests a lovely ambience with the hotel's park-like gardens in the courtyard and the sparkling pool that appears as though it has been joined to the hotel's lounge. The City Lodge Morningside Sandton can be found in one of Johannesburg's most popular Cities and offers guests comfortable accommodation with a convenient location. The City Lodge OR Tambo Airport provides comfortable, inviting accommodation for those visitors that need access to the airport and/ or are commuting into and out of the city centre. The Courtyard Hotel Eastgate, with it's Tuscan character, offers guest an affordable and comfortable stay at a hotel that is in close proximity to major motorways, airport and places to shop. The City Lodge Courtyard Hotel Sandton is ideally situated with access to major motorways and 30 minutes drive from Johannesburg International airport. The D'Oreale Grande Emperors Palace is a hotel, casino and convention resort that combines style, luxury and convenience with lots of fun. The Fairlawns Boutique Hotel and Spa in Sandton, Johannesburg was established in January 1998, originally consisting of 12 courtyard suites, the restaurant and bar. The Garden Court Eastgate, a Southern Sun Hotel in Gauteng, is popular with business executives, leisure travellers, sporting teams and their supporters. Johannesburg Airport Hotel, Garden Court OR Tambo, offers spacious and comfortable accommodation for both the business and leisure traveler. The Hilton Sandton Hotel is a one-stop-shop for corporate and leisure travellers. It is situated within walking distance from the Sandton Convention Centre. A 4-start hotel only 10 minutes away from the OR Tambo airport offering accommodation that is suitable for both the business traveller and leisure travellers and perfect for those looking to get some rest after a long flight. Indulge in the rich splendour of Africa at the Hyatt Regency, a bold landmark in tree-lined cosmopolitan Rosebank, where the rooms offer unrivalled luxury and space. The 5 star InterContinental Airport Sun is South Africa's only deluxe hotel situated at an airport, and is within walking distance of the terminals at Johannesburg International. The 5 star Intercontinental Sandton Towers Hotel in Johannesburg is conveniently linked to two of South Africa's most exclusive shopping malls, Sandton City and Nelson Mandela Square. The 5 star Melrose Arch Hotel, Northern Johannesburg is situated within the exclusive "city within a city" Melrose Arch urban development. A Bedfordview hotel offering accommodation that is spacious and comfortable and suitable for leisure and business travellers. A Midrand hotel perfect for the business traveller who is looking for comfortable and practical accommodation during their stay in Johannesburg. A 3-star Randburg hotel with over 100 rooms that are air-conditioned and include a range of features perfect for both the leisure and business traveller, conference facilities, bar, restaurant and more. Metcour Hotel, Metcourt Suites Emperors Palace, offers three star accommodation with a modern approach. The Michelangelo Hotel, located in Sandton Johannesburg, is one of South Africa's premier hotels blend luxury and modern convienience to provide todays traveler with incredible accommodation. One of South Africa's premier hotels, this five star Renaissance-style hotel is an icon of culture and taste, reminiscent of the finest hotels in Europe. Furnished with contemporary elegance, the Mondior Concorde Hotel offers world-class business and conference accommodation setting a world class standard not to be overlooked. Situated in the heart of Sandton, Johannesburg, this privately owned premier hotel is the distinctively superior choice. For the discerning guest, who seeks premier quality and elegance, the Balalaika Sandton Hotel is the perfect choice, lending its distinctive atmosphere of luxurious tranquillity to the hectic schedule of business people and tourists alike. The Melrose Arch precinct is home to the trendy and fashionable 3 star Protea Hotel Fire & Ice! Melrose Arch Hotel in Johannesburg, South Africa. The Protea Hotel OR Tambo has prime positioning near Johannesburg's international airport of the same name. It is also within very close proximity to the city centre. The central and well-equipped Protea Hotel Parktonian promises comfortable accommodation and a warm welcome for leisure or corporate guests. Providing a West Rand hotel in the suburb of Roodepoort with accommodation that is comfortable and well-equipped, dining options for all your meals, a range of activities nearby and a hotel suitable for the whole family. Offering a comfortable and refreshing stay to passengers who have a stop-over at Or Tambo Airport. 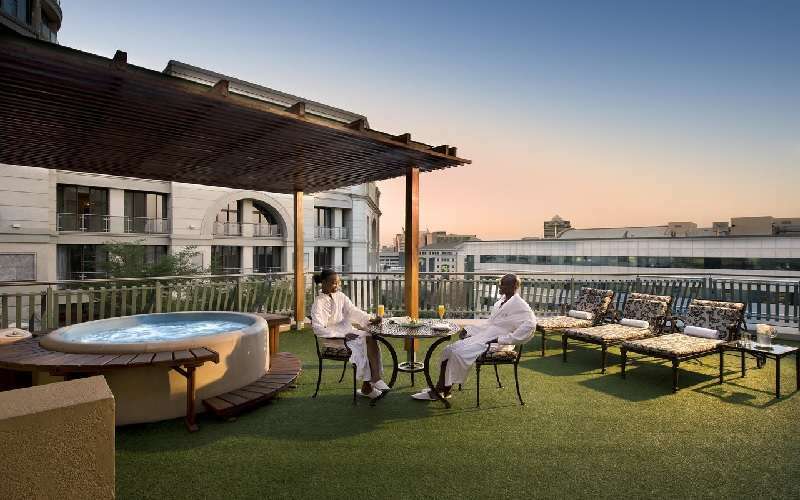 The Radisson Blu Gautrain Hotel Sandton in Johannesburg, South Africa, is centrally situated in the heart of Sandton. Situated in the stylish Johannesburg suburb of Sandton, The Raphael Penthouse Suites offer exclusive penthouse suites right in the heart of exciting Nelson Mandela Square. The 5 star Riviera on Vaal Hotel & Country Club is located on the banks of the Vaal River approximately 45 minutes drive away from Johannesburg. A one-star Gauteng lodge / hotel perfect for visitors looking to explore or have a quick business trip to Rivonia. Nestled in the exclusive Sandhurst suburb of Sandton, the Saxon makes a world class statement of ethnic African elegance, combined with personalised attention. The Southern Sun Katherine Street Sandton is located in one of Johannesburg's most popular areas, called Sandton, which is also known as the business and economic hub of South Africa. The Southern Sun OR Tambo International Airport Hotel is situated 500 metres from Johannesburg International Airport, an ideal base for the business traveler offering a wide range of convenient services and facilities. The Sunnyside Park Hotel, apart of the Legacy Hotel group is located in Parktown, Johannesburg and offers business and leisure travelers easy access to the various popular areas in the Joburg area. A Gauteng hotel located in Sandton offering luxury accommodation which includes standard rooms, 1 and 2 bedroom apartments and 3 bedroom Penthouse. Located in the select northern suburbs of Johannesburg, The Westcliff is easily accessible from the city and Johannesburg International Airport. The five star Palazzo Montecasino Hotel enjoys a convenient location in the upmarket suburb of Fourways, Sandton, with easy access to all major highways, business centres and is only a 30 minute drive from the O R Tambo Johannesburg International Airport. The Winston Hotel exudes peace and tranquillity in its design, setting and d�cor. This luxurious hotel was created using a mixture of elegant Colonial styles with modern twists. Tintswalo at Waterfall combines the convenience of its central location in the heart of Johannesburg with the charming seclusion of the exquisite Waterfall Country & Equestrian Estate.